Released on July 23rd, Edward Sharpe and the Magnetic Zeros's new album (titled, funnily enough, Edward Sharpe and the Magnetic Zeros) has been heeded by the band's front man, Alexander Ebert, as the most "rawest, most liberated, [and] most rambunctious" album he's ever produced. One may initially feel slightly disheartened, however, upon listening to the much-anticipated album. 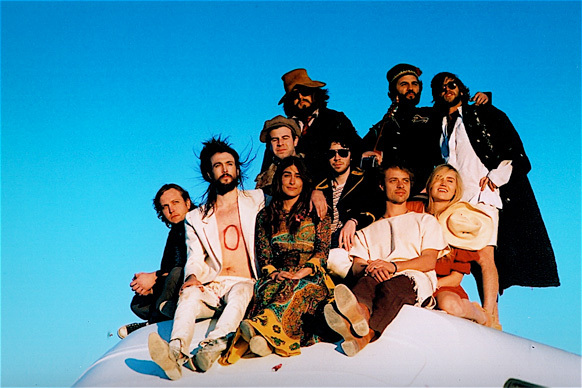 Edward Sharpe and the Magnetic Zeros's previous albums, Up from Below and Here both had distinctive stand-out songs - Home (which is still one of the band's most popular songs) for the former and Man on Fire for the latter. Better Days, the first single on the album, somehow doesn't strike the same infectiously catchy chords as Home does; nor does it emanate the gentle, guitar-produced ambience of Man on Fire. Nonetheless, one cannot dispute that the track, along with the rest of the album, embodies all the core elements of an Edward Sharpe and the Magnetic Zeros song. Listening to Edward Sharpe and the Magnetic Zeros, one will hear the distinctly soulful and wide-ranged voice of Ebert, as well as thick backing harmonies (perks of having a 10-person band) and pulsing, echoing beats. Ebert's voice is without a doubt the band's most prized asset. Those who have listened to Home will already be aware that Ebert is a more than adequate whistler; his singing voice carries the same soaring fluidity as does his whistling. Given the presence of all classic Edward Sharpe and the Magnetic Zeros’s qualities, the album is ultimately infectious. Initially not wowed by Better Days, I eventually found myself helplessly listening to the album on repeat. You’ll find yourself listening to Two, appropriately named as it is a duet between Ebert and the band's other lead singer, Jade Castrinos, whose voice is sonorous, easy to listen to, and featured beautifully on the album's 11th track, Remember to Remember. The album closes with the sentimental This Life, which is different from the other songs on the album because it is slower and distinctively more melancholic. Give Me a Sign, a track from the deluxe edition of the album (and a personal favourite), presents similarly sentimental lyrics yet maintains an upbeat rhythm. Despite the fact that 4 years – a length of time that has led certain mainstream artists to completely revamp their styles – have passed since the release of its first album, Edward Sharpe and the Magnetic Zeros still produce songs that resonate with the depth and warm-heartedness of its first album.